Here are a couple unrelated shots that I took in the last 24-hours or so. The first one here, I took today at lunch. I usually head out from the office for my noon break. I am an introvert, so while I’m friendly, I need a lot of time alone to recharge my batteries. Plus, I love to read, so I like to take advantage of my lunch hour to inhale a little fiction. So, anyhow, I often ask myself what I can find in my normal habitual environment that could prove visually interesting in a photograph? I’m always asking myself this. It forces to me to look at my comfortable—even boring—surroundings with a new interest. And after all the hours spent in my car, what’s more familiar and un-artistic than my car and the keys I wrap my grubby fingers around every day? I like this shot. I’m not entirely sure why, and I’m not sure you’ll agree with me. 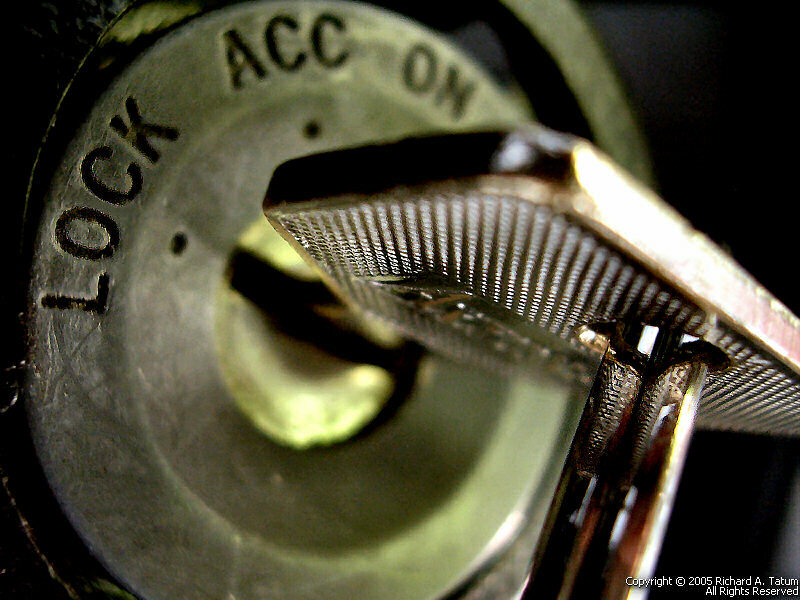 But I like the texture on the key, the scratchy texture on the ignition face and the word “LOCK” so prominent there. Keys. Locks. Starter. Monochromatic blandness. Texture. Contrast. It’s all there, and it’s got an interesting depth-of-field. I don’t think I’m saying anything here—and that probably marks me as a dilletante and not a “real” photographer—but I do get excited when beauty (or at least visual interest) crops up in unexpected, familiar places. 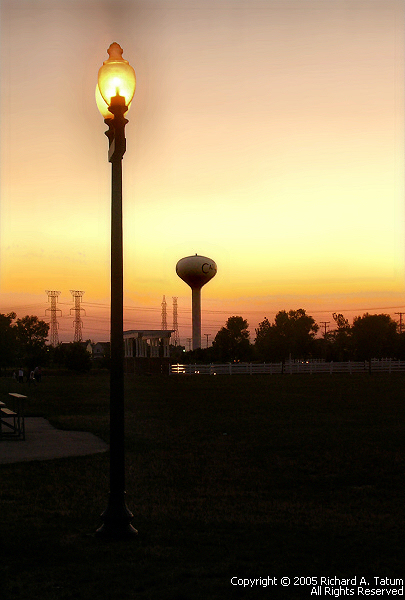 The lamp and water tower shot came last night when the kids were playing at the park. The sun was down, there was a gentle glow in the sky, and the park lamps had just come on. I loved the colors. And, more, i loved the way the two vertical figures contrasted with each other. One tall and narrow, the other distant, short, and bulbous. Again, I don’t think there’s a statement here, but driving around Chicagoland I am struck by all the fat, enormous water towers dotting the landscape. They ungainly and beautiful in an odd sort of way, but they don’t strike me as good subjects for photography. So, I was glad to take this picture. Okay. Maybe it’ll be good for me to have this memento!